In recent, 3D printing has become an eye-catchy topic among the industrial world, attracting overwhelming media attention on this renowned technology. Indeed, 3D printing is not a new technology to the industry, but was already invented for decades. Thanks to the US president Barack Obama who mentioned during the State of the Union the potentials of applying 3D printing technology in multidisciplinary aspects, 3D printing is advocated by the ?Economist? magazine that triggers the third industrial revolution to the world. In this seminar, our speaker will share with you the technology development process of 3D printing, comparison between different 3D printing technologies and materials, how 3D printing technology is applied to different disciplines such as traditional manufacturing, military, aerospace, medical, etc. Ir Bryan So is the Principal Consultant of the Biomedical, Optics and Precision Engineering Unit, Automation Service Division, Hong Kong Productivity Council (HKPC). Bryan is also the Supervisor of the Rapid Prototyping Technology Centre (RPTC) at HKPC, responsible for the one-stop consultancy services on computer-aided design (CAD), product development, 3D printing, as well as the bureau services on rapid prototyping and rapid manufacturing including PU duplication through silicone molding, small batch production, post-processing, polishing & painting, opto-mechatronics design and fabrication. His knowledge covers a wide range of industries including toys, automotive, electrical appliances, medical & healthcare, opto-mechatronics, eye wear, jewelry, etc. With more than 12 years of experience in advanced manufacturing technologies, Bryan is also the investigator for new technology development including CAD/CAM systems, automation & biomedical engineering. Bryan is currently the Executive Deputy Secretary General of Asian Harmonization Working Party (AHWP) for promoting medical device regulatory harmonization & convergence, and offering the related regulatory affairs and quality management system consultancy services in HKPC, including medical device GMP, MDGDP, ISO13485, ISO14971, pre-market notification, safety & compliance, etc. Mobile Apps are widely adopted in healthcare organizations, so as to establish a secure mobile workspace and centralized management portal. The mobile Apps can also bring about the advantages and benefits from Enterprise Instant Messaging for pushing messages, communication and collaboration; corporate drop box for secure remote file access & integration for personal life and workspace. Deadline for registration is 15 October 2014. 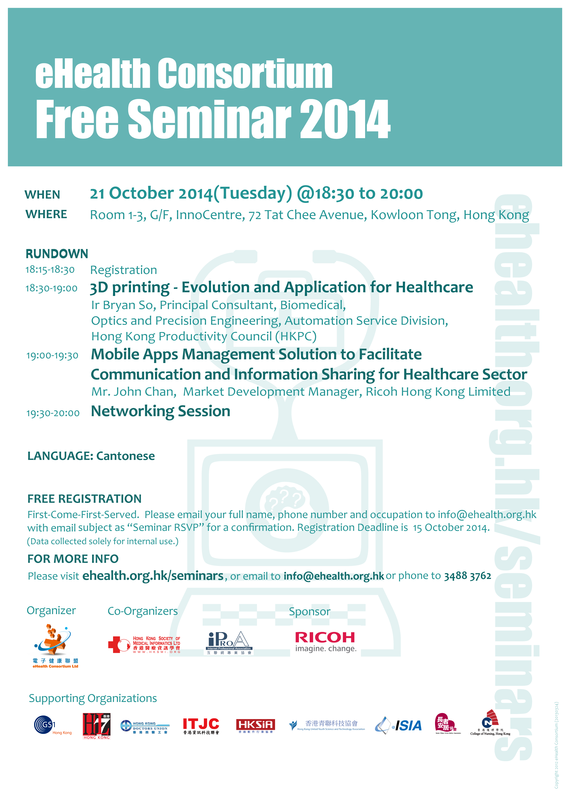 (Updated on 23 September 2014) Stay tuned for information on our next seminar!